There are still a few “flying Sabres” today. What a thrill it is to see one of these beautiful machines grace the skies. Much of my time in Grade School was spent day dreaming of flying over Korea and shooting down MiGs instead of studying grammar (can you blame me!) 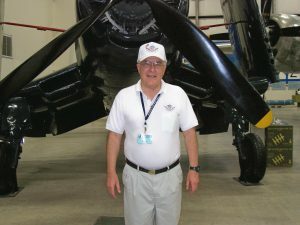 So I became a pilot and not an English Professor. In early 1945 the Sabre was developed from an earlier North American blueprint called FJ-1 Fury an early transition “prop to jet”. The Fury was slow, straight winged and lacking in any outstanding attributes. The new design was called XP-86 and was swept wing, capable of speeds near 600 mph. In 1945 the United States Army Air Force asked North American for 3 designs for a new fighter. The XP-86 was chosen. In August of 1947 The first XP-86 prototype rolled of the North American hanger and the first test flight was on 01 October 1947. This prototype became the F-86 Sabre Jet. North American and it’s affiliate Canadair Sabre produced 9,860 F-86s. On 15 September 1948, the F-86 set it’s first world speed record of 670 mph. Several test pilots in the next few years broke the sound barrier in a F-86. Jackie Cochran became the first female to fly faster then the speed of sound on 18 May 1953. The F-86 used an General Electric J47-GE-7 engine in about half of the F-86 produced. The other half used a General Electric J73-GE-3. Both engine produced about the same results. Some of the major changes through the early years were: elevator/stabilizer to an “flying tail”, discontinuing the leading edge slats in favor of a solid leading edge (which could cause “over-rotation”), larger internal fuel tank capacity, increased engine power and internal missile bay. 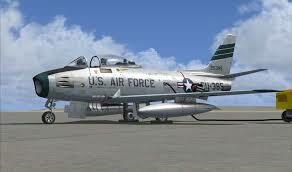 The F-86 Sabre enter the newly formed United States Air Force (USAF) in 1949 just as the Korean conflict got under way. The straight wing F-80 and F-84 did score some victories in the beginning of the conflict along with the early versions of the F-86. In 1950 the Soviet MiG-15 a swept wing fighter was superior to all United Nations aircraft as it was flown by Chinese, North Korean, and Soviet pilots. As mentioned previously, the MiG held superiority in the air as it was faster, more maneuverable, rate of climb, ceiling and acceleration. However when the F-86F was introduced, the performance difference was virtually nil. 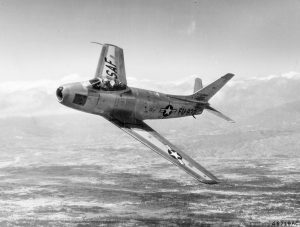 When the F-86E arrived in Korea with the all-moving tailplane was more effective at speeds at or above the sound barrier. The MiG-15 could not perform very well at speeds past 0.92 mach. This would account for the higher ratio of “kills” in favor of the F-86. The number of 792 MiG-15 losses was disputed by the USSR and the Communist Chinese sources, but the numbers add up as 335 Soviet MiGs lost while 224 MiGs were lost by the Chinese. It was estimated that about 100 North Korean MiGs were shot down as the North Koreans would not reveal their losses. 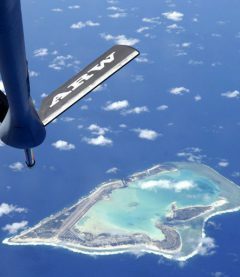 In 1958, the Chinese Nationals who had been outfitted with F-86Fs Sabres, were challenged by the Chinese Communists in an attempt to drive them out of Twain Island. Many MiG-Sabre dogfights took place. Then secretly, the USN converted the Sabres with AIM-9 Sidewinder missiles. These missiles had only recently finished being tested and very few were available to U.S. forces. The MiG-15 and MiG-17 had an altitude advantage over the Republic of China Sabres. However with the new Sidewinder missiles that advantage disappeared in a devastating way. The F-86 Sabre was used in regional disputes over the years by Pakistani in Indo-Pakistani wars of 1965 and 1971 . The Sabre also was used by the Portuguese Air Force and the Philippine Air Force replacing their P-51s with F-86Fs. 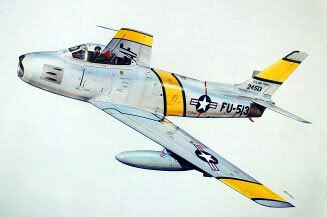 In addition to ROC, Pakistani, and Portugal, the F-86 was used by Japan, Spain, and Republic of Korea (South Korea). In fact 20 countries throughout the world have had an North American F-86 Sabre at one time or another in their military arsenal. Argentina – Australia – Brazil – Canada – Colombia -Czech Republic – Germany – Greece – Japan-New Zealand – Norway – Saudi Arabia – Yugoslavia – South Africa – South Korea – Spain – Turkey – United Kingdom. In the United States, there are over 84 F-86 on display at airports and museums through out the country. Please check with your local air museum for their display. Armament: Guns: 6-50 cal Browning Machine Guns. Rockets: Variety of launchers. Example: could carry 36 SNEB 68mm rockets. *Depending on the model and mission.